Christmas movies are my favorite. I love to sit down and put on a movie full or festive times, snowy days, and holiday cheer. As I’m writing this I am watching the movie the Nativity. There’s this part in the movie when a woman that Mary was working for had several children around and she is talking about the time when Elijah was hiding in the cave in 1 Kings 19. Though Elijah had just faced a great victory; lies and threats reached his ears that made him feel alone. Threatened. Scared. So what did he do? The same thing most of us do when we feel like the world, even God, is against us. He hid. He went in a cave and hid. God tried to get Elijah to stop hiding and remember that He was on his side and what He’s done for Elijah. He called Elijah out of the cave. While Elijah was on the mountain side huge winds began to whip around him. If I was Elijah I would have thought that maybe the winds were God. Maybe He was trying to physically pick me up and put me back where He wanted. Forcing me to face my fears. But the Lord was not in the wind. A fire began to fall around Elijah. If I was him I would have thought God was trying to scare me away from where I was hiding. Maybe I would choose to move back to where God wanted me, out of fear. But the Lord was not in the fire. Lastly, the earth began to shake. The ground opened up and rocks cracked all around Elijah. If I was Elijah I would have thought that God was done. That He was just going to allow the Earth to swallow me up and move onto the next person that would obey Him. But the Lord was not in the earthquake. So where was He? He said He was going to come. I can picture Elijah being weary. Tired. Emotionally drained. The dust around him settles. Things come to a calm. Just then a small, gentle voice speaks. It was Him. Isn’t that beautiful. The stillness. The small. God loves to be unconventional. This past November we as a family made it through the first anniversary without my dad and grandpa. They both were taken from us by cancer within days of each other the year before. It was hard. People often ask how I got through it. Truth is the threats and lies are all too familiar for me. The winds have whipped, the fire has scorched, and the earth has shaken. The answer is found in a simple identity. Jesus has many names to describe all that He is. 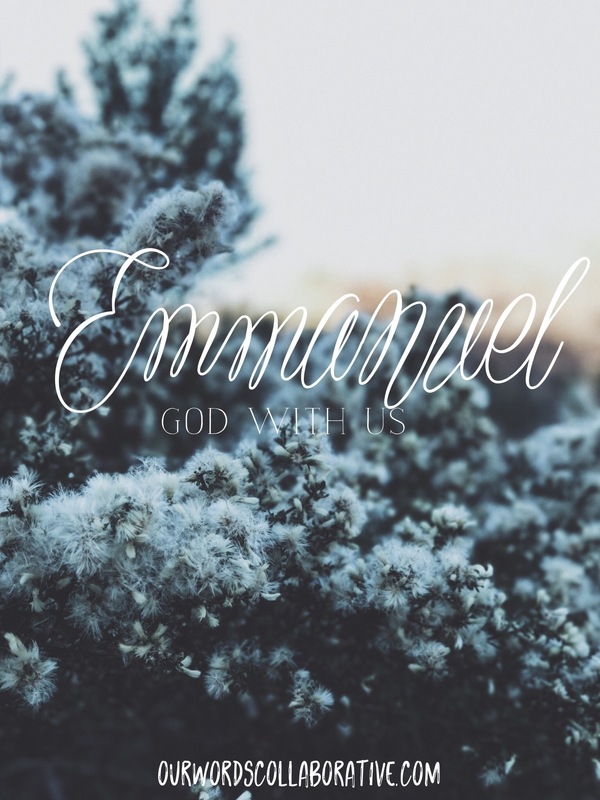 Emmanuel means God with us. When Jesus came down He was with us. He walked with us, yes but He went through life as a human. Meaning He knows what we are facing and He knows how to get through it; successfully! This is huge when we are facing the grief and corruption that life brings. When our close people die; He is with us. When our families are being torn apart; He’s with us. When life hands you lies, threats, and accusations; He knows what is feels like and He knows how to get out of it. Even when the anxieties and depression hits; He hasn’t left. He’s right there with you, guiding you. Too often we choose to look to God like the people in the Old Testament. Questioning if it’s God that is in the winds that whip around us. Questioning if He is in the fire that burns all around. Wondering if He’s shaking the earth to get your attention. But forgetting He’s in that still small voice in you. Forgetting He’s in the gift of the Word He gave us. Through all of the hustle and bustle take a moment and sit. I don’t know what memories you have of Christmas time or what this past year alone has brought you, but you have made it. A friend of mine recently sent me a picture that said, “You have survived 100% of your worse days.” How true is that? You are here, right now reading this blog. You are breathing. That means you are meant for something grand. I know the feeling of not knowing how or if I would make it through the end of the day. I know the feeling of anxiety and depression holding me down, creating a whirlwind around me. But I made it. Not through the worlds remedies, but through my God. He led me through. Dear friend, God is with you. I don’t know why life has handed you the things it has or hasn’t handed you what you want but I know that He is with you. He has you. And you’re not going to just get through these times but you’ll get through them victoriously because He is with you.